Damian Callinan stars in Newk! 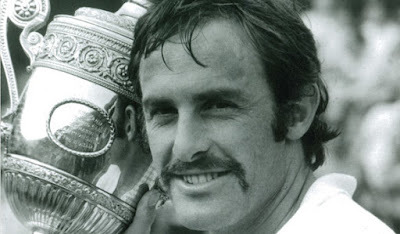 It’s 2014 and Australian tennis legend John Newcombe is turning 70 and all the greats of the sport are arriving at his place for a barbeque he doesn’t have to cook for once. Old friends and players he’s coached are here to celebrate – and Newk is ready to reminisce over a glass of Chinzano, his body liberally sprayed with Aeroguard. Comedian and comic actor Damian Callinan has grown Newk’s iconic moustache for the role and he’s perfectly cast as the laid-back champ, whose glory days are long behind him. Callinan is warm, funny and charming in the role. Playwright Kieran Carroll has done a good job digging deep into Newcombe’s life, tracing his career from high school tennis player to Grand Slam champion. There’s a lot of interesting detail about the Wimbledon boycott of 1973 to the story of how he met his wife to an interview with Johnny Carson on The Tonight Show to an advertisement for Newcombe’s How to Play Tennis album from K-Tel. After a while, the roster of names that Newcombe drops gets a bit tiresome – it feels too much like boxes that Kieran thought needed to be ticked. But there’s still some wonderful drama inherent in a scene where Newk realises he’ll miss his father’s funeral for a tennis match, or the moment he beats his hero Ken Rosewall to win Wimbledon in 1970. The anchoring device of the 70th birthday party is fun, an excuse to look back and keep things light. The show isn’t linear; Newcombe jumps around his life as a player before settling into his post-tennis career as coach and mentor. The show seems aimed at people who remember Newcombe’s career; a lot of the audience reaction was recognition of names and places and wins. But there’s a healthy dose of laughs and some cheeky audience interaction by Callinan, who had the old folks in the palm of his hand. There’s nothing inherently dramatic in the story of Newk – even as he tells us of the stroke he’s suffered, the play never really connects that with the life of drinking that went hand-in-hand with his career. Even the darkest moment, talking of the stages of a party-boy evening, when he turned from John to Jock to Jack, dissipates into laughs after he wakes the next day. Newk is a light-hearted look back at a champion of Australian sport – and if you get all the references, you’ll have a good time. And if you douse yourself in Aeroguard, you’ll avagoodweekend. Newk is on at the Butterfly Club until Saturday January 19th.